Due to inclement weather, Republic Services has postponed trash pickup until Thursday, February 14, 2019. Welcome to The Borough of Silverdale, PA! Thank you for visiting our website www.silverdalepa.org and welcome to Silverdale Borough, a community of families and friends located in Upper Bucks County. Silverdale Borough is primarily a residential community with access to great schools, multiple shopping facilities and many types of recreation activities. Whether you are visiting or looking to make Silverdale your home or place of business, we hope you find our community a great place to be. 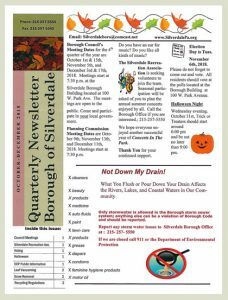 Click to download the Fall 2018 issue of the Silverdale Borough Newsletter (PDF). Residents: Please make sure that you secure all required permits prior to the beginning of any projects. Call the Borough Office if you are not sure if one is needed.